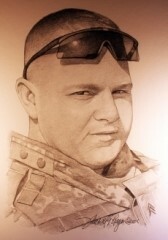 Army Sergeant Jason C. Denfrund, 24, of Cattaraugus, New York was assigned to the 2nd Battalion, 14th Infantry Regiment, 2nd Brigade Combat Team (the “Commandos”), 10th Mountain Division (Light Infantry), Fort Drum, New York. On Christmas Day 2006, SGT Denfrund and his unit were on patrol south of Baghdad when a roadside bomb exploded, taking his life. In high school, SGT Denfrund’s size and aggressiveness earned him a spot on the varsity football team as a sophomore, a pretty unusual occurrence. In 1999, he was named captain of the Cattaraugus Central High School team. At 6 feet, 240 pounds, he also ran track and was named to the first-team offense of the Buffalo News’ Division VIII football honor roll. SGT Denfrund enlisted in the Army in June 2001, serving tours in Germany and Kosovo as well as two in Iraq. SGT Denfrund’s awards and decorations include: Purple Heart, Army Commendation Medal, Army Achievement Medal and many others. He left behind a wife, step-daughter and an infant son who has been a Folds of Honor scholarship recipient.